Makani Kai Helicopters offer travelers amazing aerial views of the Hawaiian Islands. Book a Hawaii helicopter tour and see Pearl Harbor, Diamond Head, and Sacred Falls from above. 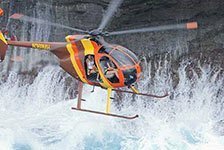 Makani Kai helicopters are comfortable and affordable, making them a great choice for a Hawaii helicopter tour.